MediMiss Aromatherapy aromatherapy candles Aromatherapy Oils candle making essential oils fragrance oils Home Remedies pure essential oil How Do You Use Essential Oils to Make "Aromatherapy" Candles? The term "aromatherapy" is a branch of alternative medicine which claims that the specific "aromas" carried by the essential oils have curative effects. The healing art "aromatherapy" traces back to 4,000 B.C. where the Greeks, Romans, Egyptians, and Persians use to burn herbs and flowers for curative and cosmetic purposes. In ancient Egypt, plant oils were widely used for spiritual relaxation, cosmetics and for embalming and mummification of the dead. The term "aromatherapy candles" is used loosely in Western societies, because, unlike other cultures, we mainly use "aromatherapy candles" for "aesthetic" qualities vs. healing qualities. We want the calming, soothing aromas to aid in meditation, bathing and relaxing activities. Natural candles are becoming more popular with the development of natural waxes such as soy wax and palm waxes. There is a greater desire by consumers to go "green" with all natural ingredients in candle making. Using all natural soy wax that is a renewable resource, grown right here in the U.S.A. has gained popularity in the few years, since the development of soy wax in 1998. Soy wax is hydrogenated soybean oil that is non-toxic, biodegradable and environmentally friendly. Combining all natural ingredients, including natural scents, to make an "aromatherapy" candle is highly desirable. A lot of so called "aromatherapy" candles out on the market today contain paraffin wax (which is a byproduct of the crude oil process) and fragrance oils that are chemically derived. Some major manufacturers have paraffin wax, combined with natural scents. Some have natural waxes combined with chemical derived synthetic scents. My idea of a natural "aromatherapy candle" is one that is all natural. So, what are natural scents? They are essential oils. Essential oils are volatile parts of plants, trees, fruits and roots that are extracted by various methods: steam distillation, cold-press extraction, chemical solvent extraction and the effleurage method. Essential oils that are "pure" will mostly have their botanical name on the jar, and come in dark colored bottles for protection from sunlight. They should be stored in cool, dark places, and out of reach of children and pets. Other essential oils are blended with carrier oils such as jojoba and are considered "diluted". Some candle manufacturers sell "essential oils", but they come in clear plastic containers, and are synthetically derived, or are blended with alcohol or other solvents. Because of their concentrated nature, pure essential oils can be more expensive than fragrance oils and come in small bottles - drams (1/8 oz), 1/6 oz., etc. They either have a closed lid or a dropper to distribute the essential oils. Price can range from anywhere from $5 to $75 for a fraction of an ounce of pure essential oils. 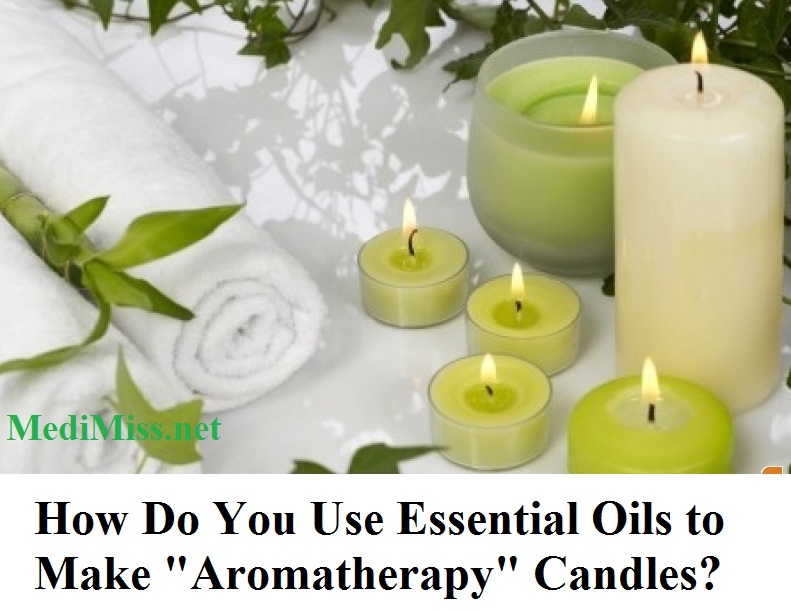 So, how do you use essential oils in candle making? Good question - and there are many answers to that question, depending on who you talk to. When I originally tried to research this topic a year ago, there was very little information out on the Internet, with candle supply companies, or any e-books I purchased. One year later, there is a wide variety of answers published in articles, candle supply websites, and so-called "candle gurus". Some experts claim that usage per pound of wax is 1 oz - which is similar to using fragrance oils. Now, 1 oz of pure essential oils can be either incredibly strong or incredibly expensive. Others claim that using as little 3-20 drops/pound of wax. 1 Style & Taste. When using essential oils in aromatherapy candles, I want a milder, less dominant, natural scent aroma from the essential oils. I don't want an over-powering Cinnamon Spice fragrance oil aroma that's going to fill my entire house for days. I want a "natural" candle, because I want a soothing, relaxing, mild, fresh, natural aroma that gives just enough scent to soothe my senses for a beautiful bubble bath, meditation, yoga or Pilates exercises. I don't want the aroma competing with what I'm trying to achieve - relaxation. 2. Cost. Essential oils are expensive, and cost should be considered when buying and using "pure" essential oils in candle making. First of all one dram (1/8 oz) of 100% pure Peppermint oil (made right here in the U.S.A.) on sale was $5/dram plus shipping. Honestly, do you think you it's cost effective to use $5 of Peppermint oil in one 8-12 oz. soy candle? I don't think so, besides, it may be too strong. Fragrance oils (mainly synthetics) can be 10 times less expensive when purchased in bulk. I've used blends of essential oils with 1/6 oz. and made three 12 oz. soy candles, and they were perfectly scented. So, it's the cost/benefit rule you have to apply in determining how much you're willing to pay to achieve your desired outcome. So, with those facts explained, using essential oils is a matter of style, taste and cost. If you are selling your candles, you pass along your costs to the consumer, but hopefully, you can market and price your candles effectively to sell them at a profit. If you are making candles for your own enjoyment, then it's a matter of what you're happy with - milder/stronger, and whether cost is a factor for you.